Beornred (Old English: Beornræd) was King of Mercia in 757. Beornred ascended the throne following the murder of King Æthelbald, however, he was defeated by Offa and forced to flee the country. There is very little information about him and mentions about him are commonly brief. 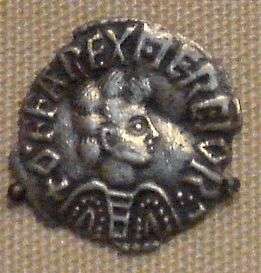 According to the Anglo-Saxon Chronicle, in 757: "...Æthelbald, king of Mercia, was killed at Seckington, and his body rests at Repton; and he ruled 41 years. And then Beornred succeeded to the kingdom, and held it a little while and unhappily; and that same year Offa put Beornred to flight and succeeded to the kingdom, and held it 39 years..."
↑ ASC manuscript E, 755 (757); translated by Michael Swanton, The Anglo-Saxon Chronicle, 1996.